On the Silver Comet Trail this morning for 10.6 miles. The SCT is one of my favorite running venues in the Atlanta area. And, it’s not very crowded on a weekday morning. I ran in the old Brooks Glycerin 9’s which now have 2500+ miles on them…still feeling good, but I can tell that the days for long runs in them are over. Will they reach 3000 miles? I think so…in small doses. I think I’m still recovering from the Vol-State Road Race in which I crashed and burned picking up a DNF (Did Not Finish.) That was on the heels of a debacle of a finish in the Peach State 300 in May which hit me hard physically and mentally. In fact, if it wasn’t for my daughter, Season, being with me and helping me in the Peach State over the last 15 miles…I might still be there trying to finish. I didn’t want to feel that way again, especially in the Vol-State. But, I could feel it coming on after 250 miles. However, the big problem then was in my back with the lower back hurting with increasing pain with every few steps. So, I decided to stop…to race again another day. It’s just that a “DNF” is hard to swallow, especially in one of my favorite races. I did wear the Altra Paradigm 1.5’s in their first race. The shoes from a somewhat revolutionary company (based on evolutionary physiology) performed very well. They held up well…better than the Hoka Clifton’s I had used in the Peach State 300. So, the good run on the SCT had me thinking of trying to get my running through the recovery and feel good for the next race coming up. I have a couple of problems to solve that I will be working on in training. One is biomechanical. The other, I think, is related to electrolyte levels in the long run. Hopefully, I can solve those before the next race. I ran a little over 4 miles today on the same course through the neighborhood that I ran yesterday. This is the second day of mileage over one-mile-per-day that I’ve done since finishing the Peach State 300 on May 25, Memorial Day. The recovery is hard. While running today, I couldn’t help but ponder on my recovery situation…how hard it has been going. The Peach State 300 was harder than anything I’ve run in recent memory. Now, recovery is slow. But, the 4-mile today was a little better than yesterday’s. I felt more coordinated, and I ran a little faster than yesterday….snail pace yesterday…caterpillar pace today. I have been in a mental and physical abyss since the race. Maybe, I’m climbing out…maybe. 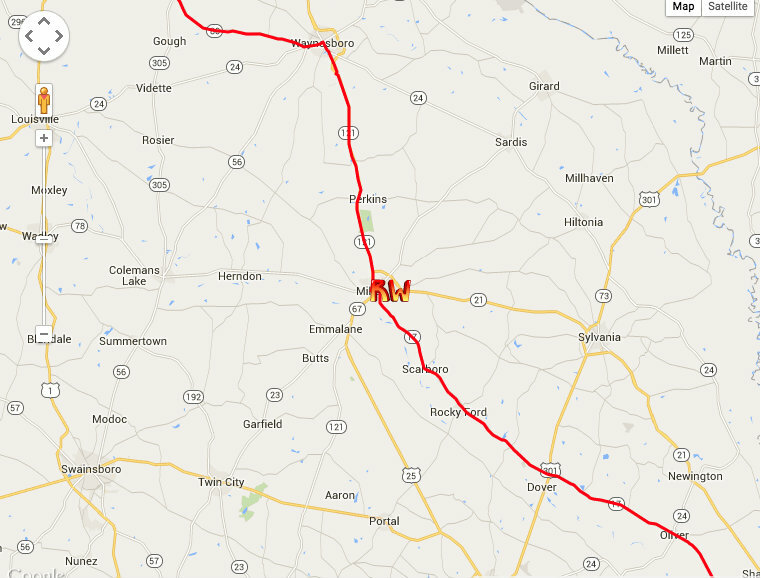 My next race is the Vol-State Road Race which is 314 miles – a few miles longer than Peach State 300 – in July. I feel that I will be ready for that one and will get through it better than the Peach State…but, in the midst of this 4-mile, I just don’t know. 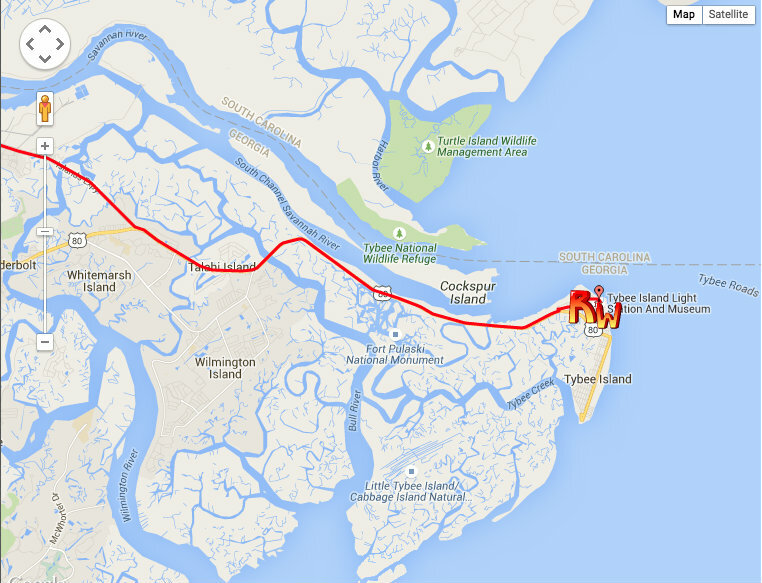 In a race from Dahlonega, Ga to Tybee Island, Ga and plotting your own route, seven runners began and three runners finished. Two runners, Jeff Dean and John Gordon, finished in the alotted time. They were both crewed along the way. Westbrook was uncrewed and ran into problems with lack of food, running 2 miles out of the way at one point, and realizing certain roads did not connect as he had mapped out…all causing delays. 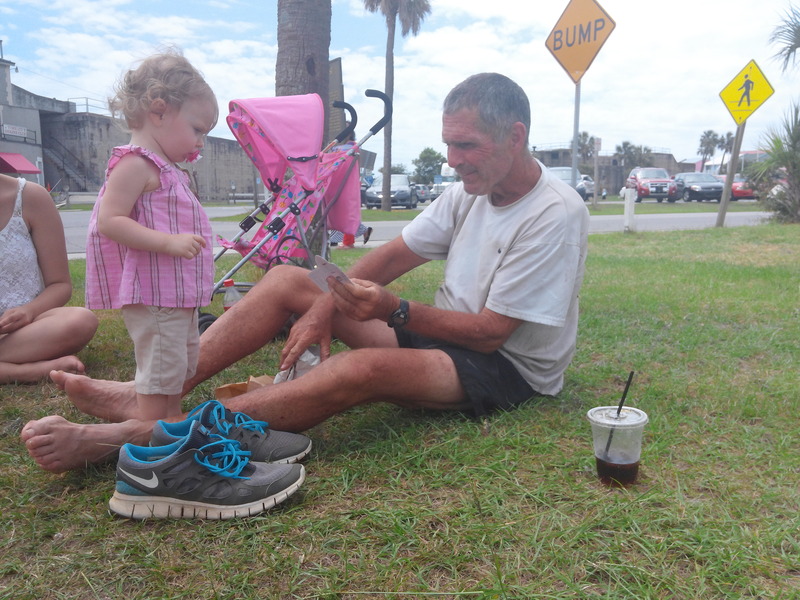 He finished the 293.70 miles (or maybe a little more) at the Tybee Island lighthouse. We lost him twice throughout the course. We had the race director search for him the first time and we drove for hours the last night and found him. Congratulations to the finishers of the PS300. Way to go, guys! 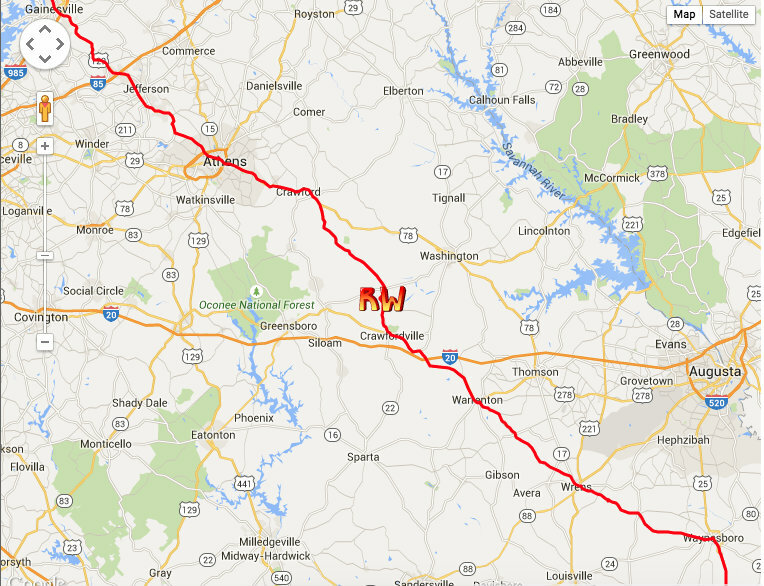 Richard Westbrook’s location at end of day 5, just before Guyton, Ga.
At the end of day 5 Westbrook has covered 245.50 miles and is just north of Guyton, Ga. Once again, his phone was dead with nowhere to charge it for him to check-in. We drove down for his finish but had to drive around and search for him through the night with nothing but his turn sheet to locate him. Still 3 runners to finish the Peach State 300. After not hearing from him for too long, Westbrook is back on track. Leaving Millen after putting 200.05 miles behind him, he has yet another long stretch into Savannah with no stores or places for food. Hopefully, he stocked up on some kind of snacks to keep him replenished. He has 93 miles to go as of his midnight check-in Saturday night/Sunday morning. Wish him luck. The race began with 7 runners and 2 dropped out after day one. As of day three, they are down to only 3 runners left, John Gordon age 43, Jeff dean age 36, and Richard “Lionheart” Westbrook age 68. Richard Westbrook’s location of end of day 3. Roughly 2 miles before Wren. Westbrook gave us a scare! His phone died on him and he was unable to call and check-in at his appointed time. When I checked in with the race director to see where he was, they set out with a search party for hours. After much going back and forth, I decided to drive the four hours or so to find him myself when the phone rang. Found him! He let us know his phone died and there was nowhere around for him to charge it. He was also unable to find a convenience store or anything for food so he went without eating for the day and night. Once he slept for all of 1.5 hours and found a McDonald’s (albeit out of the way and off course, but necessary) he charged his phone, filled his belly, and called to give us his whereabouts….THANK GOODNESS! He is still trudging along some backroads down there somewhere…. Westbrook has completed 52.04 miles for day 2 of the Peach State 300. 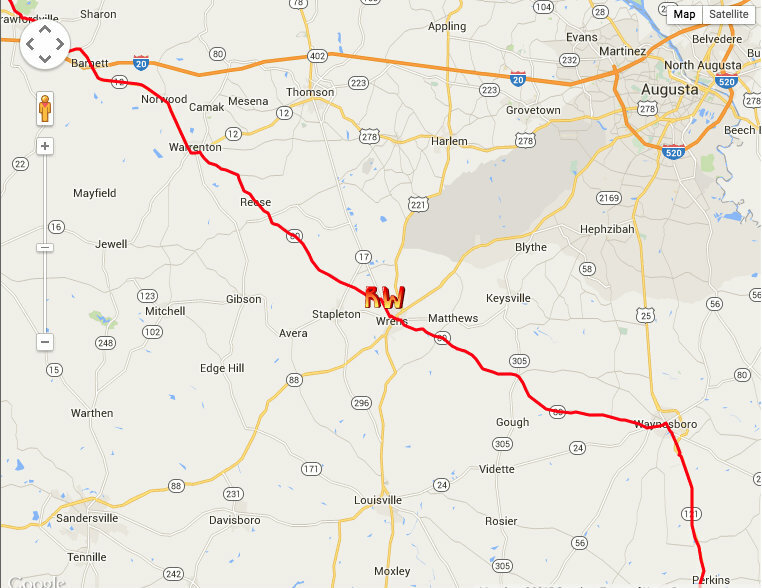 He has put behind him a total of 106.8 miles thus far and ended the day somewhere between Lexington and Crawfordville. 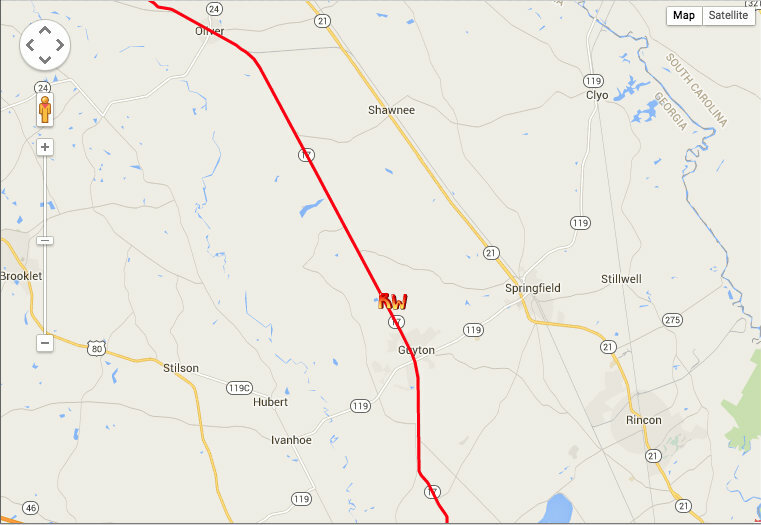 He is approximately 5 miles north of Crawfordville to begin running again tomorrow.